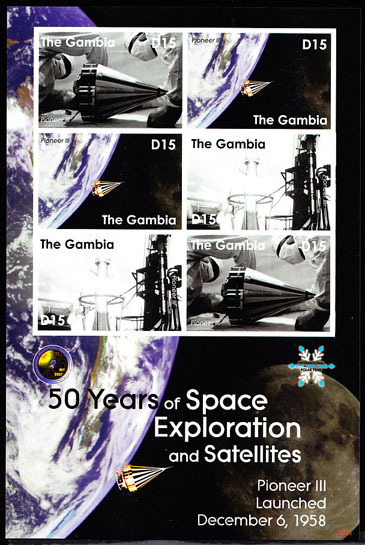 3314 ND GAMBIA (1993) Early astronomical instrument. Telescope. 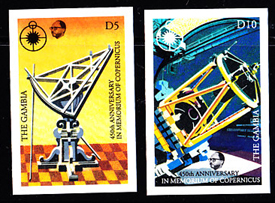 Set of 2 imperforate proofs. Scott Nos 1448-9. 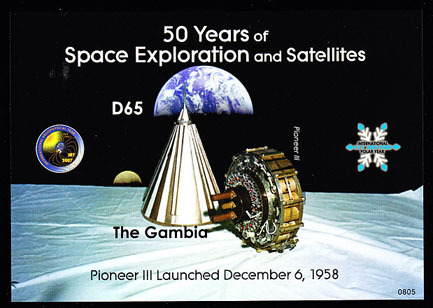 3315 ND GAMBIA (1993) Early astronomical instrument. Telescopes. 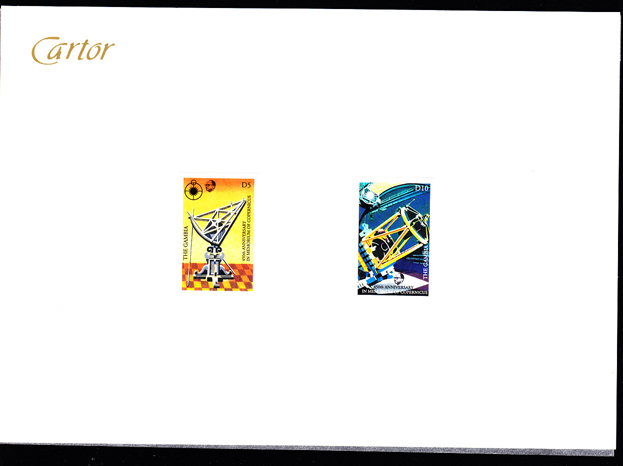 Set of 2 imperforates mounted on Cartor proof card. Scott Nos 1448-9. 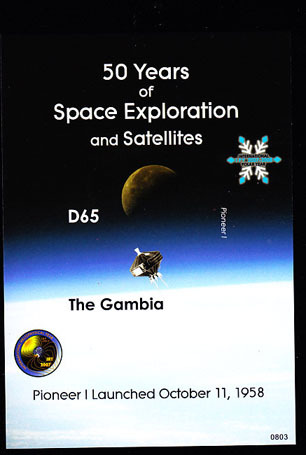 3316 ND GAMBIA (1993) Copernicus. Imperforate S/S mounted on Cartor proof card. Scott No 1550..
5201 ND GAMBIA (1995) Paul Harris. Rotary emblem. Imperforate corner block of 4. Scott No 1637, Yvert No 1840. 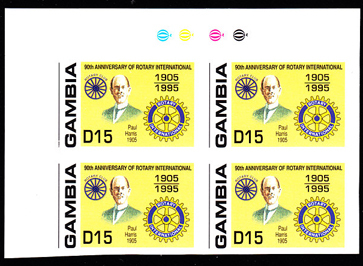 5202 ND GAMBIA (1995) Rotary in education. Imperforate margin block of 4. Scott No 1656, Yvert No 1863. 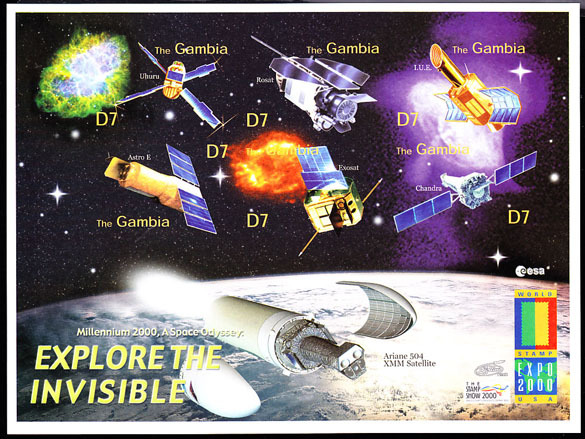 17320 ND GAMBIA (2000) Various spacecraft. Imperforate M/S of 6. Scott No 2268. 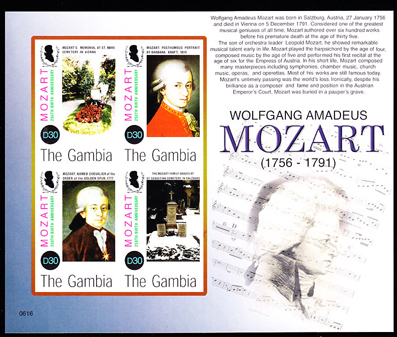 1925 ND GAMBIA (2006) Mozart*. Imperforate minisheet of 4. Scott No 3023. 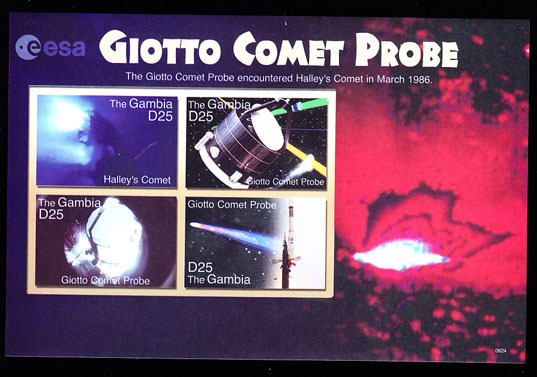 17336 ND GAMBIA (2006) Giotti Comet probe. Imperforate M/S of 4. Scott No 3047. 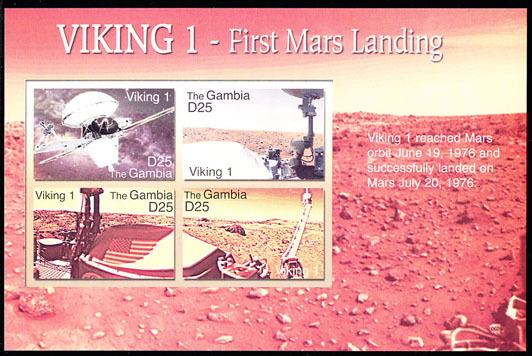 17337 ND GAMBIA (2006) Viking I 30th anniversary. Imperforate M/S of 4. Scott No 3048. 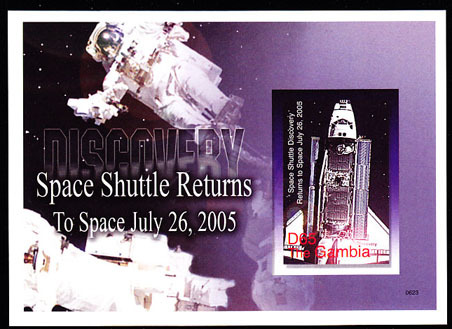 17338 ND GAMBIA (2006) Space shuttle returning to space. Imperforate S/S. Scott No 3049. 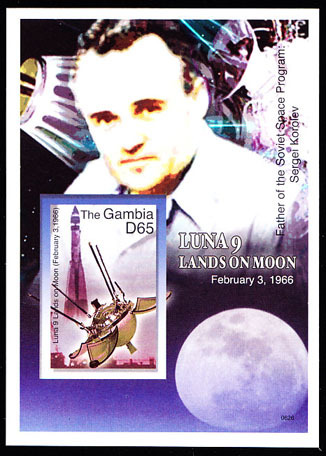 17339 ND GAMBIA (2006) Luna 9 lands on Moon. Imperforate S/S. Scott No 3050. 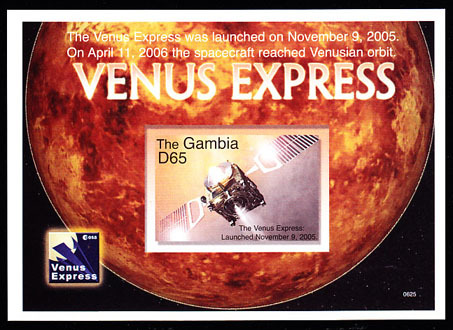 17341 ND GAMBIA (2006) Venus express. Imperforate S/S. Scott No 3052. 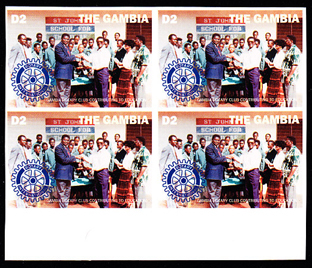 17353 ND GAMBIA (2008) Views of Pioneer I. Imperforate M/S of 6. Scott No 3148. 17354 ND GAMBIA (2008) Views of Pioneer III. Imperforate M/S of 6. Scott No 3149. 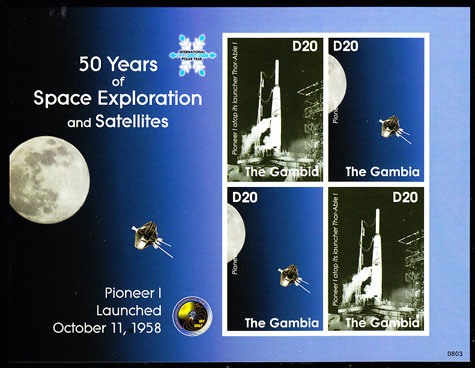 17355 ND GAMBIA (2008) Pioneer I launch, orbit. Imperforate M/S of 4. Scott No 3150. 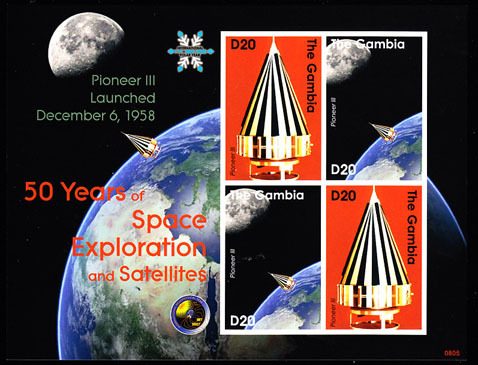 17356 ND GAMBIA (2008) Pioneer III launch, orbit. Imperforate M/S of 4. Scott No 3150. 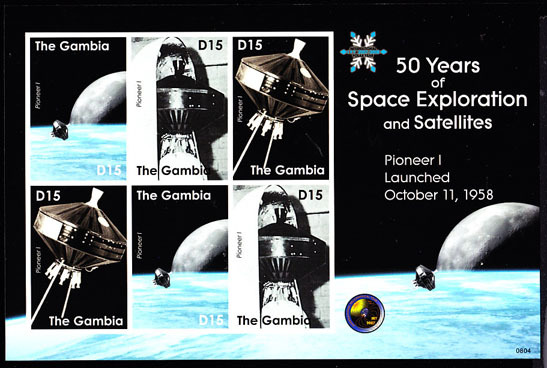 17357 ND GAMBIA (2008) Pioneer I. Imperforate S/S. Scott No 3152. 17358 ND GAMBIA (2008) Pioneer III. Imperforate S/S. Scott No 3153. 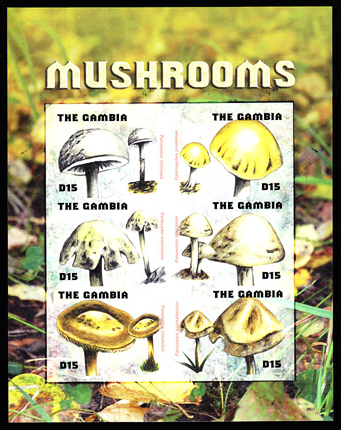 1878 ND GAMBIA (2009) Mushrooms*. Imperforate minisheet of 6. Scott No 3220. 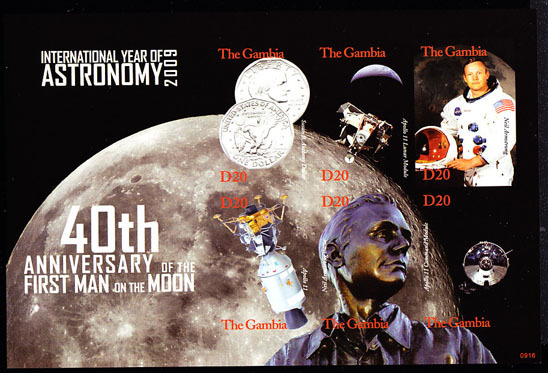 17366 ND GAMBIA (2009) 40th anniversary of first man on Moon. Susan B. Anthony coin. Imperforate M/S of 6. Scott No 3198.